There's an apartment building on Vine Street in Hollywood that is famously home to several of the most well-known faces of Vine, a social media platform that Twitter announced on Thursday it would be shutting down indefinitely. The news came as a shock to some, but the 6-second video-making residents of the building were not among them. "To be honest, all of us are doing such bigger things now that none of us are super worried or anything," 21-year-old Viner Logan Paul told CNNMoney. "I wish I could say we're all crying, but no, we're just hanging out." Those "bigger things" Paul referred to include movies, TV projects and a host of opportunities that have presented themselves to he and his fellow Viners after launching their careers by making micro-videos. He recently made a movie that was released on YouTube Red called "The Thinning." Vine might be going away, but the platform's most popular -- and, one could argue, luckiest -- stars aren't mourning, they're moving on. In fact, they've been looking toward the after-Vine era of their careers for some time. I got off my plane this morning to find out @Vine is being shut down whaaaaaaaat 😱 Lots of good memories. Damn. His most-watched Vine features him appearing to dash into Los Angeles traffic to retrieve a cat from danger. It's been "looped" over 50 million times. Paul would post new videos multiple times per week on the platform, where he has 9.4 million followers. But he hasn't posted since April and hasn't made a video exclusively for the platform in a year. The same goes for his friends, he said. They all decreased their use of the Vine once it was clear it had "plateaued." Zachary Piona was a college student working a server in the Bay Area when he started making it big on Vine in October 2014 . At his peak, the 24-year-old's sketch-style comedy videos, which he presented to 3.3 million followers, produced enough ad revenue that he could quit his serving job. Now a graduate with a degree in psychology, he hasn't posted on Vine since March. He migrated to making videos on platforms like Twitter and YouTube because he wasn't having fun on Vine anymore. "I wouldn't call it a sell-out app ... but it just turned into a less fun thing," he told CNNMoney. He's recently been courted by other apps hoping to lure him to their platforms, but he said he's focused on honing his acting and writing skills. He also admitted he's "hesitant" to try new platforms in light of Vine's downfall. Thomas Sanders, who made a name for himself making comedic, slice-of-life Vines, said he too would urge caution. "A platform has always been a means to showcase your skills, so if it's making you happy, I would say go for it -- invest. But prepare for the worst, I guess," he said. Preparation was key in Paul's case. Early on, he said, he put considerable effort into building up his presence on other platforms -- like Instagram and Facebook -- and customizing his viewers' experience on each. He also worked on turning his internet fame into real opportunity. A Business Insider profile once put Paul's worth at $1 million. Sanders similarly expanded his reach by taking his show on the road. He recently ended a 17-city tour of his original musical "Ultimate Storytime," and he's ready for more. "I've always wanted to expand and push the limits of my comedy and this is going to be that kind of trial by fire, pushing me out of the nest," said Sanders. Those who haven't done the work to expand their footprint, though, will have a hard time starting now, Paul predicted. "I feel like if you haven't already done it, you're going to be out of the internet game and it's going to be really hard to make a comeback," he said. He's not worried about the top Vine stars, though. Many of them appear in his upcoming film "Airplane Mode," a movie starring 40 of the Internet's biggest social media creators that aims to be "the 'Airplane' of this generation," said Paul. About 60 percent of them come from Vine backgrounds. "When we made the movie we made sure to get the best of the best and the people who would stay relevant throughout time," Paul said. Singer Shawn Mendes, Nash Grier, and Cameron Dallas, who has a new show coming to Netflix, are likely the most notable famous names to launch from Vine to date. 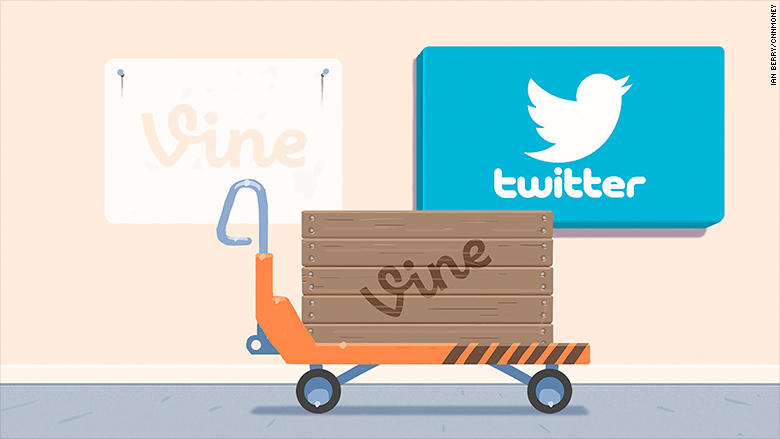 But for those who are still building their names in mainstream entertainment, the hours following Vine's demise were filled with quippy Twitter comments. Vine stars would have seek unemployment, some users joked, or "get real jobs." Paul said he thinks this reaction stems from "ignorance." "My favorite question is, 'What are you going to do now?' And I'm like, 'What do you mean? I'm killing it and I'm going to keep killing it," he said. Sanders isn't worried about his fellow Vine personalities either. "I have no doubt in my mind that they are going to go far regardless of this platform," he said. "They made it there because of their skills and through those skills they're going to blossom in new ways and on new platforms."